Do Wild Dogs Like Milkbones? Apparently, if the negligent scuba buddy and the hybrid sharks don’t kill you in Australia, the dingoes are ready to finish the job. I thought Meryl Streep already solved this mystery. 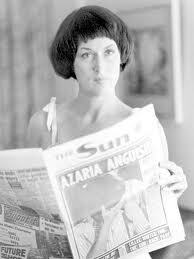 Nice Dorothy Hammel cut there, Meryl. But apparently, the parents of the nine-week old baby that disappeared in the Australian outback 32 years ago are not happy that her death certificate lists the cause of death as “unknown,” and want the certificate to reflect that a dingo killed her. And they say they have new evidence on just how dangerous these dingoes are. The evidence concerns several dingo attacks on infants and young children since Azaria’s death. Her parents expect the court to declare officially that Azaria was killed by a dingo, rather than by her mother Lindy Chamberlain, a lawyer representing parents Lindy and Michael Chamberlain said. Hmmm, I’m intrigued. What sort of evidence might there be in a 30 year old case? Mother, Lindy Chamberlain-Creighton and her former husband Michael Chamberlain were reunited at the inquest to hear evidence of hundreds of dingo attacks across Australia over the past three decades. Rex Wild QC, counsel assisting the Northern Territory coroner, gave evidence about three fatal attacks on children and 14 other incidents, most of them on Fraser Island in Queensland. They included that of ten-year-old schoolboy Clinton Gage, who was savaged to death by a pack of dingoes on the holiday island in May 2001. The court heard from Anne Lade, a former police officer hired by the court to investigate the case. Ms Lade said there had been many attacks by dingoes, which had caused injuries and at least three deaths. Holy wild dogs! Hundreds of attacks? Hundreds you say? Good thing we won’t be sleeping in any tents out in the Australian outback. Now that our departure for Australia is less than 72 hours away, I notice that number of shark-related occurrences in my everyday life is multiplying. My diving buddy for life and I went to the hardware store yesterday morning. We realized that we had forgotten to order one nifty and useful device that Arnaud had with him during our dives in Vieques: an underwater rattle. It’s a metal tube with beads inside it that someone can shake to get the attention of the other diver. Very handy. We knew we wouldn’t be able to find one around here or order one online in time, so we went to the hardware store to see if maybe we could jerry-rig something. 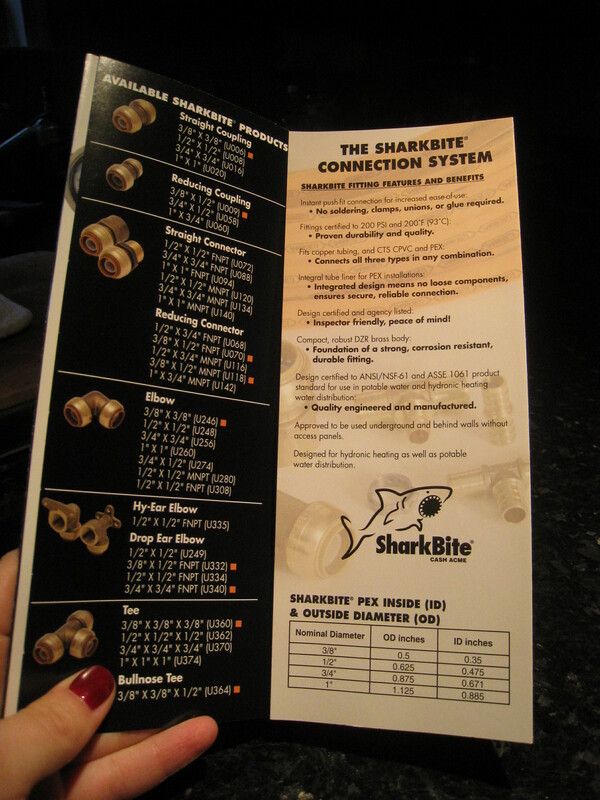 While looking in the plumbing area for metal pipes and caps, we saw this little brochure. 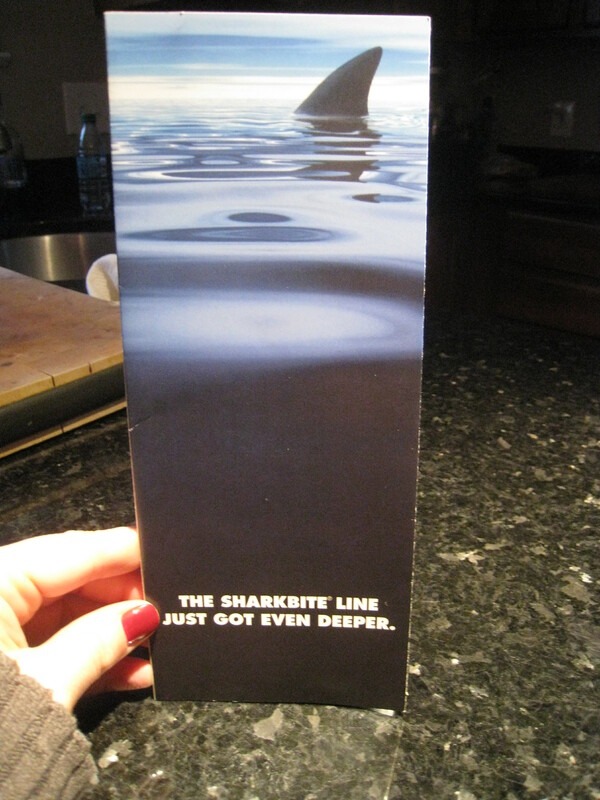 It was advertising a line of pipe products called, oddly enough, Sharkbite. No idea why. XFE found this incredibly amusing. Later in the day, we checked the mail and this lovely birthday card was addressed to me. Yes, that is a shark with a swimming lady in it’s teeth. No, it’s not another warning from those gangsta Old Town Crafting Mafia ladies. 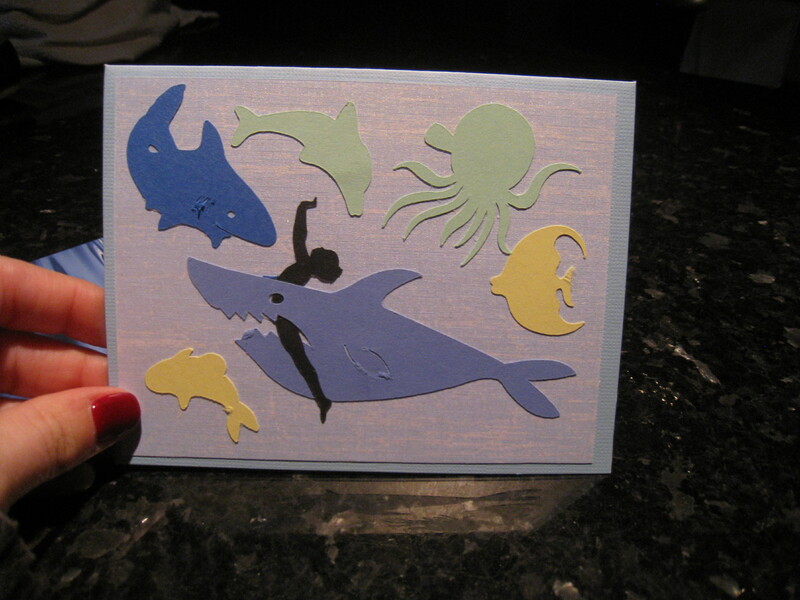 It’s a handmade card from XFE’s mom, along with a very generous check and instructions to not get eaten by the sharks. Very funny. Dark humor runs deep in the XFE family. 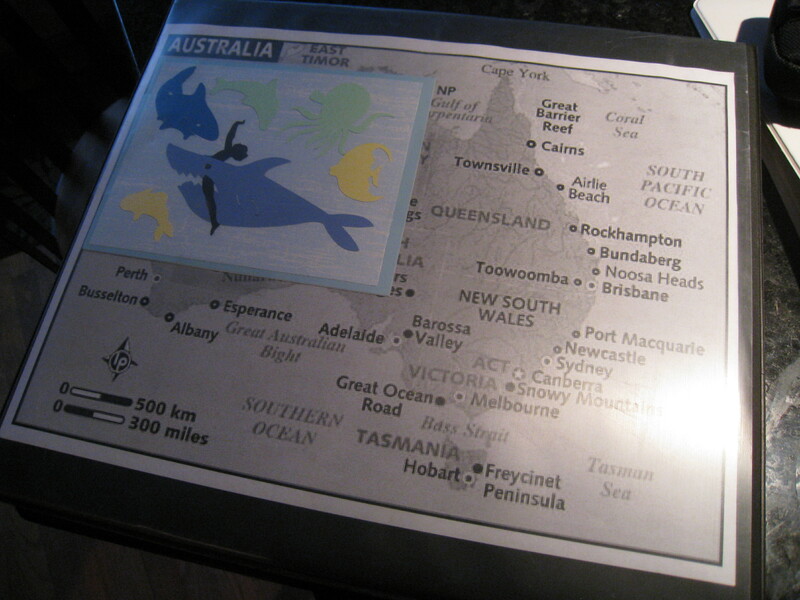 The card now adorns our Australia planning binder, also known as “Put Another Page In the Barbie,” or “Barbie” for short. We are binder people. I’ve made them for many of our longer trips, including our Ireland trip in 2009 and our Milan/Venice/Zurich trip in 2011. What? Do you really think a girl who lusts for the perfect packing matrix wouldn’t have a tabbed binder with reservation info, attraction details, and specific maps from our hotel to whatever we happen to be doing that day? Puh-leeze.